Two TSA security checkpoints at BWI airport are closed. Earlier the TSA said it was closing one of them due to “excessive callouts.” A spokesperson also says this is a slow travel night & it’s not uncommon to close one on such a night. The Transportation Security Administration has closed one of three security checkpoints at the main airport in Maryland until further notice due to staffing issues created by the government shutdown. 'Yesterday, TSA began exercising a contingency plan at Baltimore/Washington International Thurgood Marshall Airport due to excessive callouts,' the agency announced in a press release on Sunday. 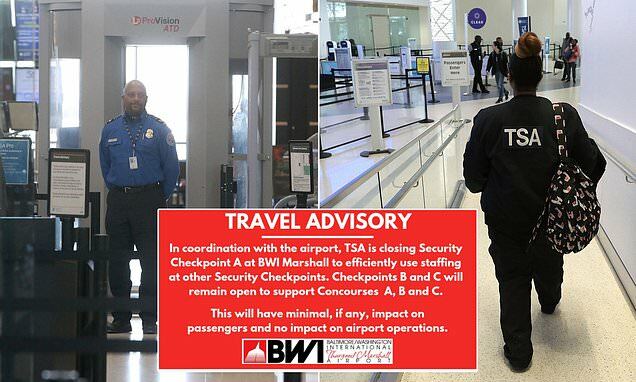 The BWI airport said it expected 'minimal, if any' problems for passengers due to the indefinite closure of at least one checkpoint, thanks to agents missing work while they are not being paid due to the shutdown. A second checkpoint was also closed at BWI on Saturday, ABC News reported. Airport spokesperson Annette Fisher said on Sunday it's not unusual for the TSA and BWI to open and close security checkpoints based on projected travel levels, flight schedules and security staffing. On Sunday, TSA said that the agency screened 1.6 million passengers total on Saturday, and that overall, 99.9 percent of passengers waited less than 30 minutes and 93.8 percent of passengers waited less than 15 minutes. According to TSA, PreCheck passengers on average waited less than 5 minutes. At BWI, the longest wait time for standard security checkpoints on Saturday was 23 minutes, and 12 minutes for those who have PreCheck. 'While national average wait times are within normal TSA times of 30 minutes for standard lanes and 10 minutes for TSA PreCheck some airports experienced longer than usual wait times,' the agency said.